There is nothing like the privacy, convenience and luxury of a U.S. Bank Arena Suite. With just a phone call, we will be happy to handle all the details and leave you free to build relationships that build business. Want to rent out a Suite for a concert, family show or sporting event? U.S. Bank Arena will gladly accommodate your needs. Our Sky Suite allows up to 30 guests and the Super Suite accommodates up to 50 guests. For a large corporate party, The All Access Bar and Grill on the fifth floor can serve up to 250 guests. Suite interior amenities include a television monitor with limited DirecTV, refrigerator, cabinets, buffet table, and manually controlled heating/air conditioning. Private Party Suites are not just for entertaining clients and closing those big deals. Why not look to do something different and fun for your next birthday celebration, anniversary, Sweet 16, family reunion, retirement, bachelor/bachelorette parties or engagements. The possibilities are endless! We can customize a package to fit your needs. 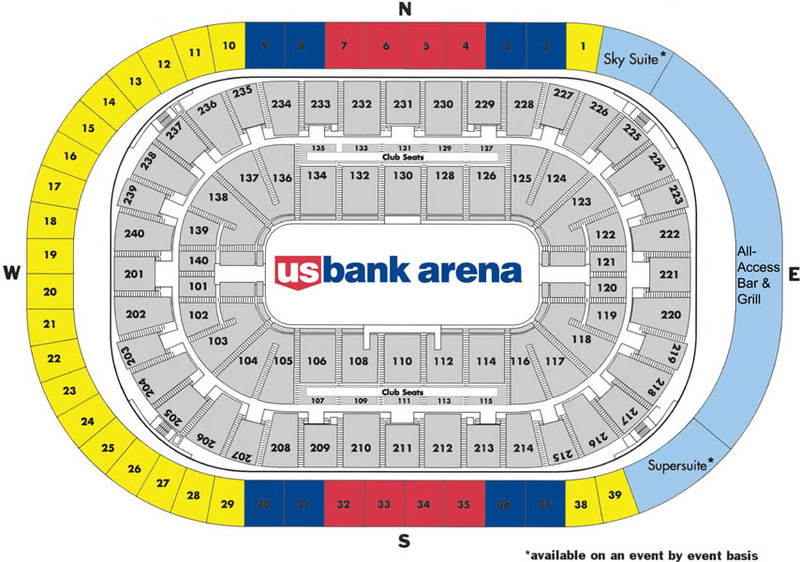 Click here for a suite chart for U.S. Bank Arena. Club Seating at U.S. Bank Arena is the premium way to experience new and exciting events with a terrific sight line to all of the action. Located at the top of the Lower Bowl, our large theatre-style Club Seats are wider and plusher, come equipped with a built in table/cup holders and have in seat waiter/waitress service. One, two and three-year contracts are available. Club Seats are not available on an event-by-event basis.